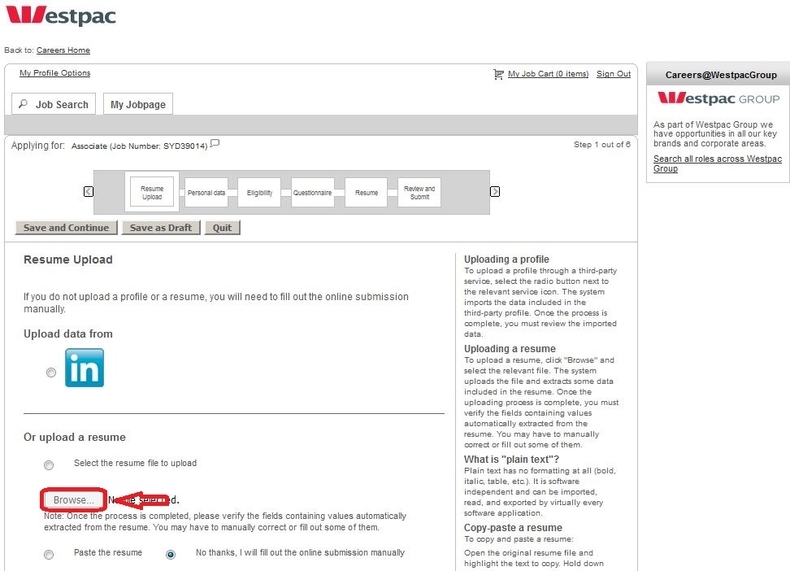 Visit the Westpac careers page at westpac.com.au/careers and click "Westpac job search" to find a job opportunity for you. Enter keywords and location to quickly search the position you are interested in. 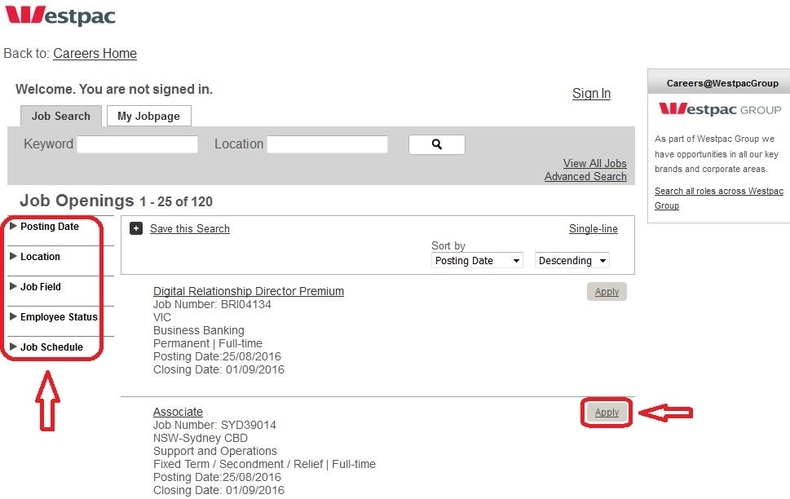 You can also browse the job openings list or filter it by location and job fields etc. to find a position for you. 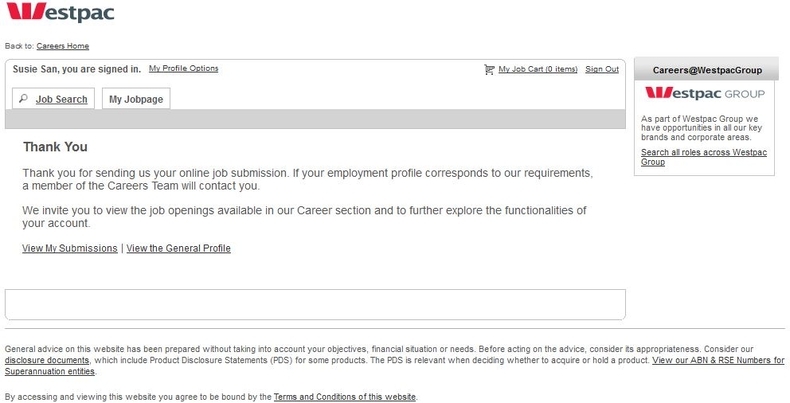 Click job title to view the job details, or you can directly click the "Apply" button to start your application. Enter your user name and password to login. 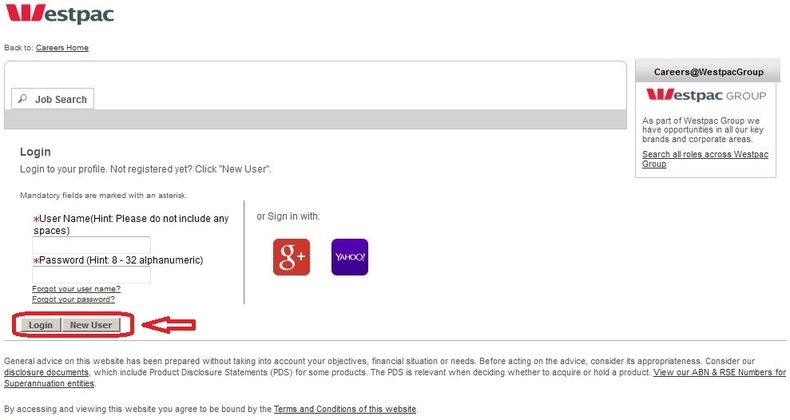 If you are a new user, you can click to create a new account for you or you can choose to sign in with your google plus account or Yahoo account. Upload your resume and then click "Save and Continue" to move on. 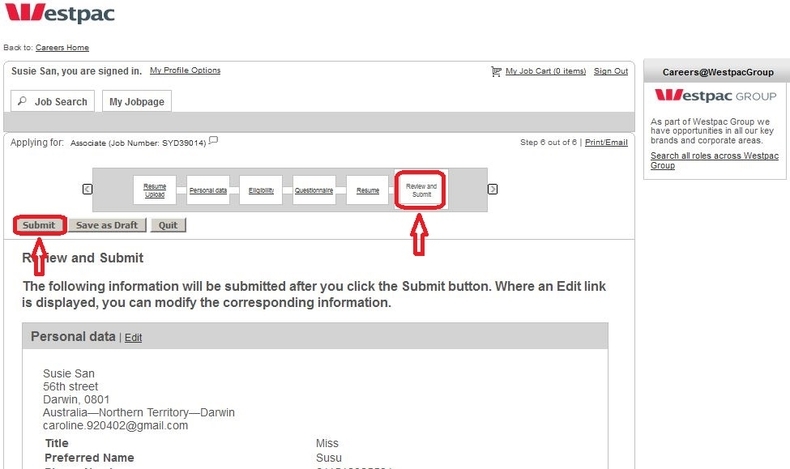 If you do not upload a resume, you will need to fill out the online submission manually. Fill the blanks with your personal data and then click to save the information to continue. Asterisk fields are required information. Follow instructions to answer questions regarding your eligibility and fill in the questionnaire after that. 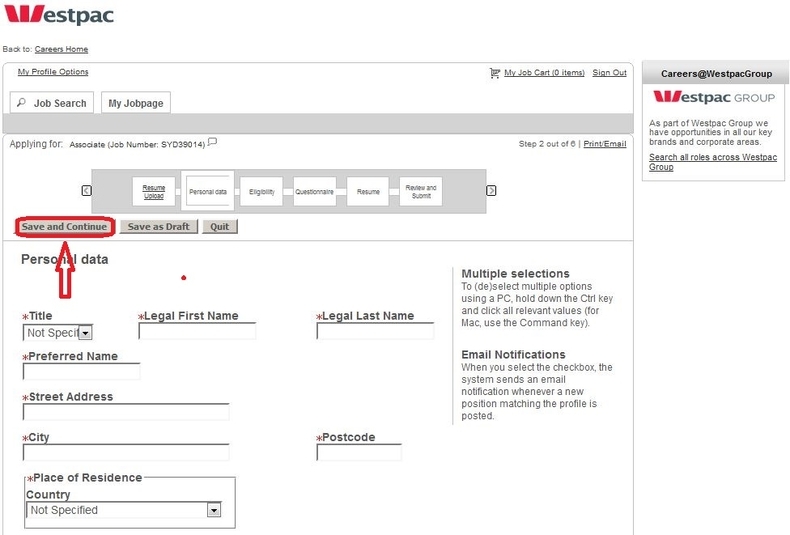 You must fill in all the fields marked with asterisk and then click "Save and Continue" to move on to the next step. Review the information you provide in each step. You can click the button to edit the information in any step. If all the information is provided accurately, you can click the button to submit your application. Submit your application means your online application has been finished. A member of the HR team will contact you if your employment profile corresponds with their requirements. 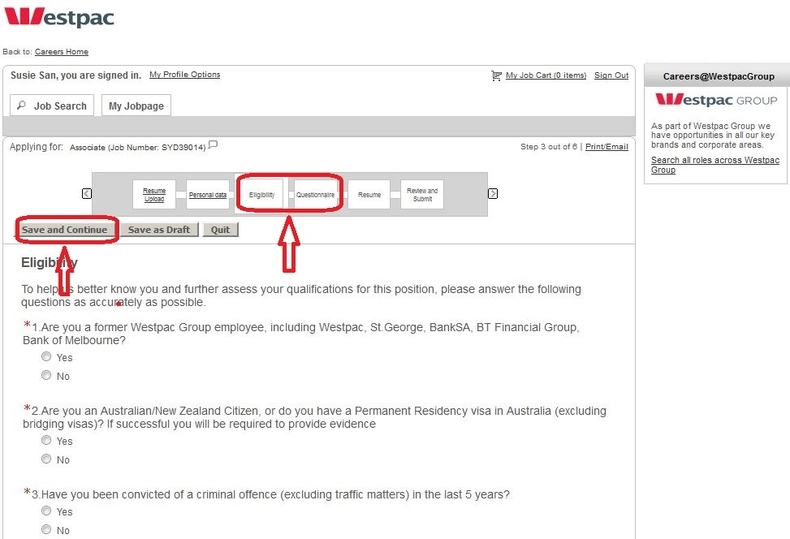 Click westpac.com.au/careers to apply for Westpac jobs online.